The innovative APLS Triage Tarp System features a highly absorbent core that quickly wicks away blood, water, and bodily fluids, therefore maintaining a low slip surface. Available in five standard colors - Green, Yellow, Red, Gray and Black - the modular APLS Triage Tarp System can be easily configured to meet the scope of any mass casualty situation. The APLS Triage Tarp System is scalable - each 6' x 12' color-coded APLS tarp can be adhered to another APLS tarp via heavy-duty Velcro that is stitched on the sides of each tarp. Any combination of pads can be quickly and easily secured together based on the number and types of injuries. 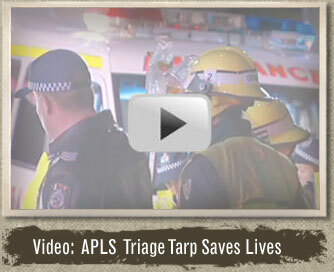 The APLS Absorbent Triage Tarp can also be secured to most surfaces via reinforced grommets in the corners of each pad.